What Does it Really Mean to Have Gratitude? Happy Thanksgiving from Journey to Joy Counseling! This week is full of cleaning, shopping, preparing, and cooking for many people. It’s easy in the busyness to get lost in the planning and lose sight of what this holiday is all about: Gratitude. According to the Oxford Dictionary, gratitude is “the quality of being thankful; readiness to show appreciation for and to return kindness”. 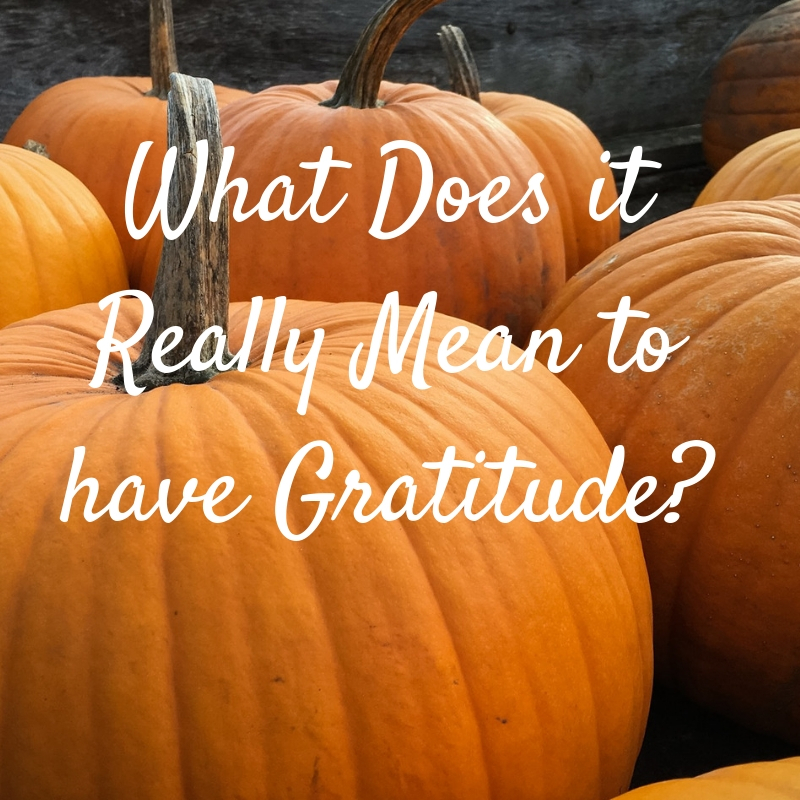 But what does it really mean to have gratitude? How do you work to increase your gratitude? This week we are going to discuss what gratitude really means, and what it looks like in action. Gratitude forces you to be present, and to see things in the here and now. When you are grateful, you don’t worry about the future or fret about the past. You take a moment in your current situation, and you count your blessings. Maybe it’s a precious moment with your children, a time of deep connectedness with your spouse, or a period of recognition for you at work. Maybe it’s a song that makes you smile or a memory that pops into your mind. Being present means taking a moment to savor those wonderful things. It’s blocking out all the worries, anxieties, and stresses of life. It’s being mindful and intentional. Having gratitude means that you choose to look at the world as the glass half full. It means even when life is hard, and times are difficult, you choose to find small things to be thankful for. There is always going to be something negative you can choose to spend your time on. Or, you can choose to find a moment of joy even in the darkest of times. This truly is a choice. This doesn’t mean that life isn’t hard. Because it is. It just means that your attitude reflects thankfulness. It means that you are willing to find the smallest glimmer of hope when things feel very hopeless. Gratitude is all about a deep, convicted belief that you have been shown kindness and favor. It means you have a full understanding of your current situation. It means that you are able to take a step back and thoroughly enjoy where you are. Being grateful is taking stock of all the blessings you have and thanking God for them. It can be as simple as being appreciative of a pretty sunset, your child’s laugh, or flowers blooming. Sometimes it’s just being thankful for breath and life. Gratitude is about recognizing that you have been blessed with more than you deserve. None of us really deserve what we have. We are blessed to live in a country that has more freedoms; with the ability to choose what faith we practice, how we spend our money, and what we do with our time. We are blessed just because we were born in the country we were born (or immigrated to). In our country, we don’t have to worry about war, famine, or lack of medical treatment. We are privileged, and we are lucky. It’s important to take a moment of humility every once in a while to remember that. It’s also important to recognize that there are many people who are not as lucky. Being humble means that you have a modest view of yourself. That means putting others before yourself and loving your neighbor. When you have humility, you are called to love others through action. Gratitude teaches you to see things through a lens of awareness. For example, when you think about being grateful for your job, can you see all the people, connections, and doors that had to open all at the right moments for you to be where you are? Sometimes gratitude simply is taking a moment of self-reflection and being attentive to your current situation. It makes you realize how blessed you are to be right where you are. Awareness causes you to take inventory of your life and your blessings. It’s seeing how life could be, and being thankful for how it is. Being grateful doesn’t just mean taking a moment to self-reflect. It means taking action because you are thankful. So how can you show gratitude by doing? Take some time to do something nice for someone else “just because”. Pay for someone’s order in the drive-thru, or leave an encouraging note for someone is a start. It’s a way to live your gratitude out. When you see a need, work to meet it. If someone is battling cancer and is struggling financially, do something kind for them. If you pass a homeless person on the street, buy them a meal. Sit with someone who is lonely or grieving. You can show gratitude to others just by showing up. Think about the people in your life that you owe a debt of gratitude. Sometimes it’s someone who had a profound impact on your life, or maybe it’s just your spouse doing the dishes for you. Make sure that you are verbalizing your appreciation by saying thank you, writing them a note, or expressing your gratitude publicly. You never know the impact your gratitude may have on their lives. People who take time to practice gratitude are generally more emotionally happier, physically healthier, are more positive, and enjoy life more. According to Psychology Today, gratitude is also shown to decrease the impact of depression. It’s important that you integrate practicing gratitude into your daily life. One of the easiest ways to do this is by keeping a gratitude journal or a blessings jar. Every day you write down at least one (sometimes two or three) things that day that you are grateful for. When you are having a difficult time, you can look back at the things you’ve written down to remind you that there is always, always something to be grateful for. As you celebrate Thanksgiving this week, among the hustle and bustle of the holiday, take some time to be grateful. Be present, be aware, and show gratitude to the people around you. Here at Journey to Joy, we are thankful for YOU—our readers, our clients, and our community support system! We pray you all have a blessed and Happy Thanksgiving!